The Burlington Kensington 2 Tap Hole Bridge Curved Spout Basin Mixer (230mm centers) with Invisible Overflow, create the perfect period bathroom with our range of quality chrome plated traditional taps. Comes with a 10 year guarantee. 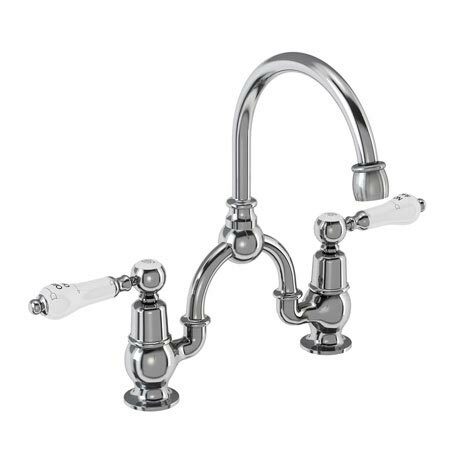 All Kensington taps have ceramic lever handles. Create a stunning traditional aesthetic in your bathroom with the Kensington curved spout basin mixer. It evokes the style of a bygone era making the perfect complement to any classically styled bathroom. It is made from a brass interior for a strong and robust body, and has been finished in polished chrome plating, giving it a shine like no other. From the world renowned traditional bathroom ware manufacturers Burlington, it's not hard to see why this basin mixer is the perfect addition to your bathroom. The Burlington Classic Basin Invisible Overflow and Waste is to only be used with basin's custom made to use this function.